Holika Holika AC MILD Red Spot Patch is a set of 12 patches specially for the treatment of acne, inflammations, wounds and red spots. A real panacea! The patches are filled with extracts for reducing infections and skin irritations. At the same time, the skin is nourished and hydrated, preventing dry skin. Bacteria are removed, prevented, and the occurrence of new pimples is prevented. This set contains 12 patches in two different sizes, so you can target different spots in a targeted way. Contains 12 patches with 2 different sizes. Treats acne, inflammation, wounds and red spots. Reduces infections and skin irritations. Nourishes and moisturizes the skin. Make sure that the spot you want to treat is clean and dry. Attach the patch to the skin before you go to sleep. Remove the patch after 8 to 12 hours. Use the patches during the day for protection against dirt and bacteria. Cleanse your skin with the Holika Holika AC MILD Cleansing Foam. Then use the Holika Holika AC MILD Toner to remove the last traces of dirt. Then apply cream: Holika Holika AC MILD Emulsion. 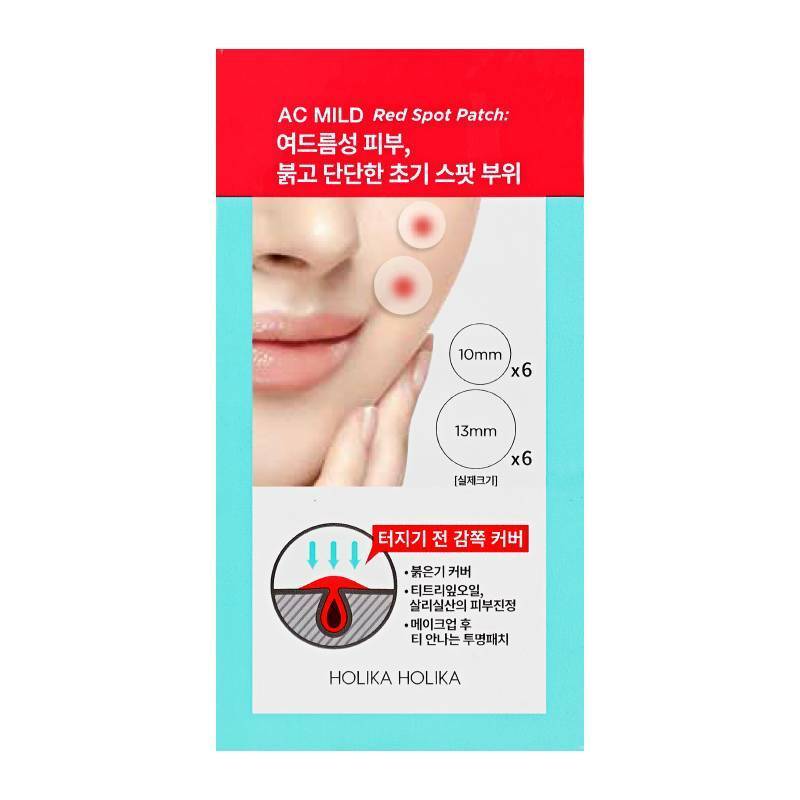 If you have pimples or inflammations, apply the Holika Holika AC MILD Red Spot Patch or Holika Holika AC MILD Yellow Spot Patch before sleeping. Tip! : Cut the patches into 2 or 4 pieces if you want to treat a smaller spot.